3.4 You will have the opportunity to identify and correct input errors prior to making your booking by contacting us by email info@hotelphilibert.com or by telephone 0033 450 792 518. 4.3 All amounts stated in these terms and conditions or on our website are stated inclusive of VAT / TVA. 5.2 Payments may be made by card payments, Visa and Mastercard (we do not accept Amex). Card fees are not applicable. 6.1 If you would like to change your booking in any way, you should contact us to discuss your requested changes. We reserve the right to accept or reject any changes you may request. An administration fee of €30 may be applied. 6.2 Sometimes it is necessary or prudent for us to make changes either before or after the contract is made. We will provide written notice of the change. If we notify you of a change to a booking under this Section 6.2, you shall have a right to cancel the booking and receive a full refund of the price paid in respect of the booking. (a) [at least 14 days before the event in respect of which the Contract was made begins]. (a) at least 15 days before the event begins, in which case it will be loss of deposit. 8.3 In order to cancel a contract under this Section 8, you must send to us a written notice of cancellation by email using the contract details specified in these terms and conditions. 9.6 We will refund money using the same method used to make the payment. In any case, you will not incur any fees as a result of the refund. (d) you are responsible for ensuring that the booking price is paid for in full when required. 14.1 You hereby agree that we may assign, transfer, sub-contract or otherwise deal with our rights and/or obligations under these terms and conditions providing that such action does not serve to reduce the guarantees benefiting you under these terms and conditions. and us in relation to bookings made through our website, and shall supersede all previous agreements between you and us in relation to such bookings. 19.1 These terms and conditions shall be governed by and construed in accordance with [French law]. 19.2 Any disputes relating to these terms and conditions shall be subject to the [exclusive] jurisdiction of the courts of France. 20.2 These terms and conditions are available in English and French. 21.1 This website is owned and operated by Venture Vacances. 21.2 We are registered in France under registration number 829 394 337 R.C.S. Chambery, and our registered office is at 81 Rue de Plautret, 73260 Aigueblanche, France. 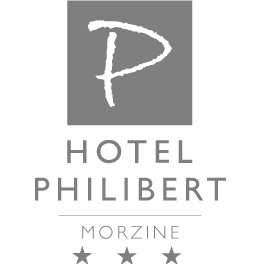 (d) by email, using info@hotelphilibert.com.